Let’s face it: dogs tend to sleep in the oddest positions. Whether your dog sleeps on the couch, on the bed or on your feet using your slippers as a pillow, you likely must have wondered at least once or twice why dogs sleep in weird sleeping positions. Believe it or not, you can discover some interesting findings about dogs just from the position in which they sleep. While your dog’s sleeping position perhaps may not reveal as many insights as human sleeping positions do, it’s sure interesting learning what your dog’s sleeping positions may possibly mean: to each their own! You might see this sleeping position in dogs a lot in the “dog days” of summer. Indeed, this is a favorite summer sleeping position that looks quite silly, but your dog sure knows what he’s doing. 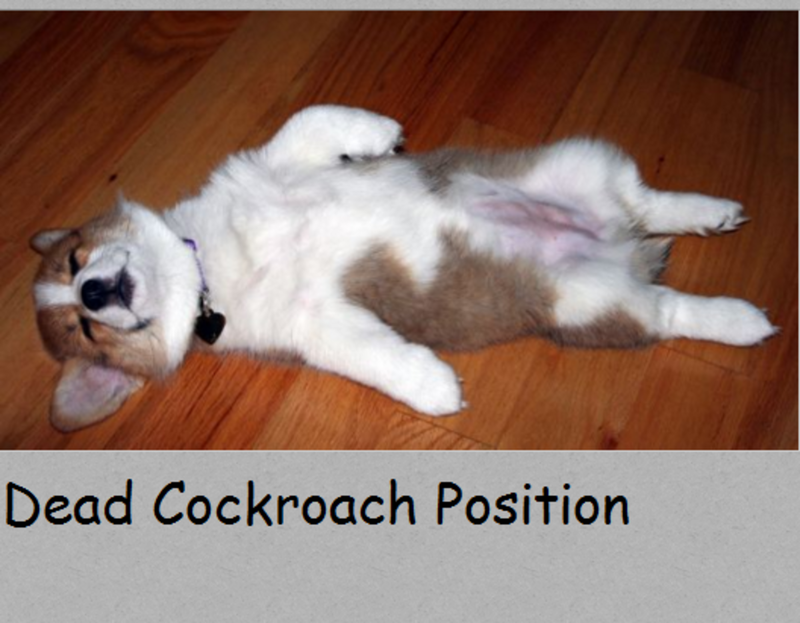 Turns out, “the dead cockroach” position is one of the best ways to cool down. Indeed, if you take a look at your dog’s tummy you will notice he has some areas with little fur so by exposing it to the air, he’s granted some speedy cooling. On top of that, his big paws are also exposed to air which helps out since that’s where a dog’s exclusive sweat glands are located. Most likely, your dog is sleeping in the curled up, nose-to-tail snowball position when the temperatures start dipping. Indeed, this sleeping position is the best way to conserve heat. You’ll often see Siberian huskies sleeping this way, with the tail strategically covering their nose for further warmth. However, there may be more to that. This position is somewhat similar to the human fetal sleeping position for the fact that it involves being curled up. Other than keeping warm, this is a protective position reminiscent of ancient times when dogs used to dig up a den and sleep curled up inside. Indeed, this position not only kept dogs warm, but it also had a protective function as it helped protect vulnerable organs from dangerous predators, explains Margaret Gruen, a board-certified veterinary behavior specialist working for North Carolina State Veterinary Hospital. Like the human fetal position, a dog sleeping in this position may be trying to feel secure and therefore can be seen sometimes in a new puppy or dog exposed to unfamiliar territory and in need of some time to acclimate to his new place, adds Dr. Gruen. This position indeed allows the dog to be on his feet immediately if need be. Does this mean that if your dog is sleeping in this position he’s feeling insecure? Not necessarily. Just as in human behavior, there are no rules written in stone. Did you know? The curled up position may seem comfy and make a dog feel more secure, but it’s one of the less restorative sleeping positions. By sleeping curled up, your dog’s muscles are likely tense and therefore he’ll be less likely to slip into the REM stage, which is the most restorative sleep stage, explains veterinarian Dr. Karen Becker. A dog who is sleeping flat on his side with legs extended is also comfortable in his surroundings as it takes a bit to get back on his feet from this position. This is a restful position that works very well for restorative REM sleep. You have likely seen your dog pawing, chewing, kicking, twitching and paddling while sleeping in this position and you might be wondering whether he’s dreaming about chasing the neighbor’s cat or eating that sandwich you left unattended on the kitchen counter. Regardless, consider that REM sleep seems to occur much more frequently in puppies and elderly dogs. This is a similar position to what your dog assumes when you cue him into a “down.” I remember back in dog training school, our trainer teachers under which we apprenticed, wanted our dogs in a perfect “sphinx-position down” with the front legs straight in front and the rear legs nicely tucked under. Why so much emphasis on getting dogs in this position? This was the best position to get the dog from a down position to sprinting in little to no time. The position therefore was optimal for “down/stays,” followed by a recall, so when the dog was called, he could quickly get up on his feet and run towards us. You might see this as a transitional position when your dog is sort of in between awakening from sleeping and getting ready to do something. At times, this can be a sign of dog who isn’t too comfortable in his surroundings so he can be ready to react, but it may also be seen in a dog who is ready to sprint into action to follow his beloved owner around at a moment’s notice. This is certainly a position that grants many chuckles and one of the most shared on social media. It’s a variant of the sphinx position, with the back legs instead of being tucked in, being kept stretched straight out as if the dog was flying. What does this position tell about your dog? Again, as with the dead cockroach position, this may be an attempt to cool down; however, instead of cooling his belly by airing it upwards, he’s cooling down by laying on a cool surface such as moist grass, tiles or hardwood floor. You may likely see your dog assume this position after playing hard. Suddenly, he plops down, and since the floor’s surface feels good, he stretches his four legs out and falls asleep in this awkward position. 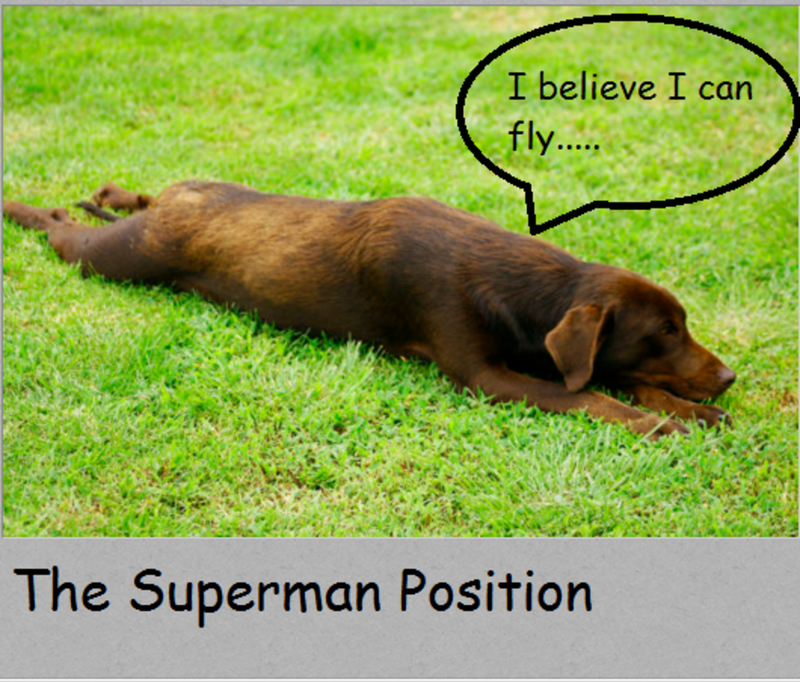 A bit like the sphinx position, the superman position offers the advantage of allowing your dog to sprint into action as needed. 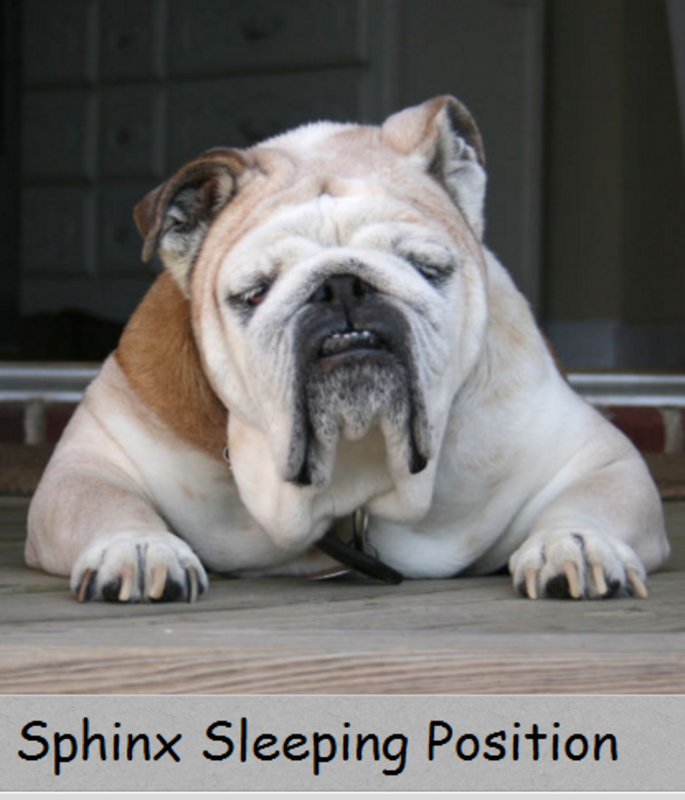 As seen, your dog’s sleeping positions can give you a few insights on what may be going on in his body and mind. In many cases, you may find that your dog sleeps in a certain position just because it’s comfy and feels good. How does your dog sleep? Regardless of how your dog sleeps, consider that it’s important that he has the opportunity to do so undisturbed. Sleep deprivation can lower a dog’s impulse threshold and increase reactivity. As the saying goes “let sleeping dogs lie.” Just as humans, dogs need their daily dose of sleep so they can restore their energy, get relief from stress hormones and wake up happy and relaxed! “Rest and relaxation is important to the management of biological and emotional stress as it allows the body to recover from releases of ‘stress’ hormones such as adrenaline and cortisol. 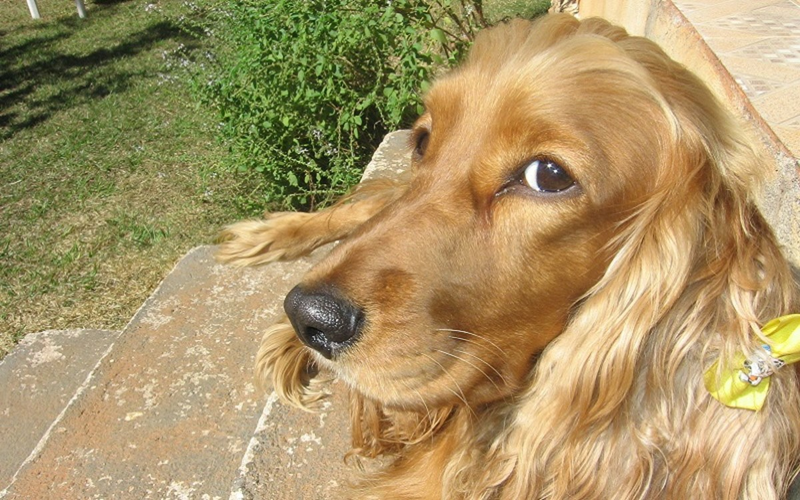 “~ Lizi Angel, Canine Mind. How Do Dogs Interpret Hugs?